Teesside Lions will view this game as an opportunity missed. An opportunity to beat one of the top sides disappear in a fourth quarter which saw key man Alvaro Pontes and sharp shooter Chris Jordinson foul out with seven minutes remaining. This effectively gave Leeds the game and Coach Thomson decided to run his youngsters as 15 year old pair Anthony Reed and Jack Ridley along with 16 year old pair Owen Waddington and Joe Coombs shared three spots. The game began with Tigers stretching out a 2-6 lead in the first three minutes and both teams looking an even match but in the sixth minute the impressive Jay Broodie produced an ‘And 1’ play which gave inspiration to Leeds and by the ninth minute the Tigers were 11pts ahead. Lions did respond with a nice shot from Jordinson and two free throws from Pontes to reduce the deficit; 10-17. The second quarter was a much better start from Lions as they produced an 6-0 run via Nascimento, Pontes and Hanson hitting his first of 14pts bringing the score to 16-17. Both teams would struggle to score an open play basket in the following five minutes although 4 free throws each would be converted. Pontes had already visited the line on five occasions hitting 7/10. Lions had plucked away at the Tigers lead and looking to head into half time right on the ankles of the visitors until a pair of 3’s from Chris Hughes and Richard Inniss dealt a sucker punch and earned the Tigers a half time lead of 23-31. Both teams traded baskets in the third period with Lions chipping away at the 10pt margin only for Leeds to reinstate the value. Both teams were finding scoring difficult such was the tenacity of the defence. The size and strength of the Tigers made it difficult for Nascimento to have his usual impact on the game and the usually reliable Jordinson was struggling to connect his shots. This left the scoring duties to Pontes and Hanson and both had to work hard for the spoils. Hanson, making his debut, impressed with 14pts, 6pts in the final quarter, the only points scored by Lions as Tigers went on a 37-6 rampage to finish the game comfortable winners. Lions had managed to contain Australian import Jarryd Moss to just 5pts and Hughes to just 15pts before the final quarter and it would have been interesting to see how the game would have finished if Pontes and Jordinson didn’t foul out, the away trip to Leeds will hopefully provide the answer. The MVP award was given to Jay Broodie of Leeds Tigers. Broodie hit 20pts and collected 11 rebounds in what was a sleek performance from the young forward. 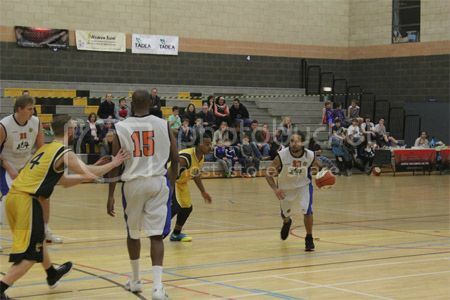 Lions travel to Kingston Panthers on Saturday before entertaining Newcastle Eagles II on Sunday 15th December at Eston Sports Academy. Visit www.teessidelions.com to keep updated.